This is the last of Pearl's four volumes devoted to the 1951 Casals Festival in Perpignan, and possibly the best of the lot for collectors who want a single sample of the entire series. 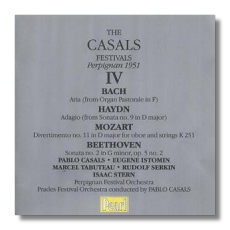 Casals the cellist, the conductor, and the humanist are equally represented on this CD. The Festivals were part of an ongoing effort to entice Casals out of the silence he imposed upon himself because of his anger over the world's failure to respond to the human rights abuses perpetrated by the Franco regime in his Spanish homeland. The music itself was the ultimate enticement, of course, but Casals was given the opportunity to work with many of that era's most illustrious musicians in the Festivals, and they in turn considered it an honor to work with Casals, even if it meant momentarily putting their solo careers aside. As a conductor, Casals compensated for his lack of technique with his demand for extensive rehearsals, which really were more like master classes. Every rehearsal took the musicians to the heart of the music they were playing. Casals taught the players everything he knew about articulation, phrasing, and the production of expressive tone, to name three. The ten minutes of rehearsal excerpts from the Prades Festival the year before (Bach's A-minor Violin Concerto with soloist Isaac Stern) show how much loving attention Casals devoted to articulation – the ever-flexible engine that drives the music. Mozart's Divertimento is as bright as a newly-minted pfennig. No porcelain music-making here: Casals and the Festival Orchestra are in a celebratory mood, and Marcel Tabuteau's oboe solos have indelible personality. The brief Bach and Haydn cello solos are elegiac and almost unbearably beautiful. This is playing that stops time – a skill Casals always had in abundance. Not just cellists but singers as well could learn from his control over tone, and from the way his phrases breathe. The only downside is Casals's grunting, which can be either distracting or endearing, depending on one's mood. (Why do cellists have more tics than the other string players?) The Beethoven cello sonata, where Casals is assisted by Rudolf Serkin, is another vital, human performance with abundant personality and technical know-how. After hearing this recording, the alternatives seem a little dull. Earlier issues in this series were compromised by distorted sound, as if the original Columbia LPs had been played with a dull stylus. That problem is much less noticeable here. Producer and transfer engineer Roger Beardsley is to be commended for his work on this CD. If you're interested in the Casals legend, and in divining the difference between personality and ego, then this disc is an excellent resource.